When did the Civil War begin and end? Most would say it began at Fort Sumter and ended at Appomattox. A less conventional view could be that the war began and ended on Arlington Ridge, in Virginia. For the Union, the conflict existed so long as its enemy’s armies occupied national territory. The first piece of Rebel-occupied territory taken back by the Union Army was Arlington Ridge. The last encampment of the Union Army, four long years later, was on Arlington Ridge. Although it is generally accepted that the Civil War began at Fort Sumter, it is difficult to exactly fix the start of the conflict. The insurrection didn’t happen all at once. In 1859, John Brown and a small band of followers raided and captured the federal arsenal at Harpers Ferry. This was a crime of individuals, not an act of statewide insurrection, and he was hanged by the state of Virginia. On Jan. 9, 1861, Rebel gunners fired artillery rounds at the Union steamer Star of the West as she attempted to resupply Fort Sumter in Charleston Harbor, S.C. The ship was forced to withdraw. A state had defied the federal government. Yet no war existed. Despite these early acts of defiance, efforts to avert war continued. In February 1861, former President Tyler played host to a peace commission to iron out the differences between the states. Twenty-one states sent representatives to the gathering, which was held in Washington’s Willard Hotel. The commission failed to find a compromise, and disbanded. War seemed imminent, but did not yet exist. On April 12, 1861, Gen. P.G.T. Beauregard, commander of Rebel forces in Charleston, ordered Fort Sumter shelled. The fort’s commander, Maj. Robert Anderson, surrendered the garrison a few hours later. Yet efforts were still made to keep the union, and the peace, intact. Although most people would say war existed from April 12, 1861, the Union leadership still remained fairly calm. As tensions mounted between the federal government and the Southern states, it became apparent that Washington needed defenses against a turbulent Virginia, just across the Potomac River. On May 23, 1861, Virginians voted to secede. Alexandria, within sight of Washington, was a hotbed of insurrection, though the farmers of the adjoining county, which included Arlington Ridge, largely favored staying in the Union. Now, suddenly, the land just across the river was Rebel territory. When President Lincoln and his generals looked across the river, what did they see? Arlington Ridge. Cannons could easily be placed there to shell the Union capital. Union troops crossed the river to seize Arlington Heights at dawn, May 24, 1861. A special detail commanded by Col. Ephraim Ellsworth of New York crossed on steamers to seize Alexandria. Once ashore, Ellsworth hurried to remove a Rebel flag flying from the Marshall House, an Alexandria inn owned and operated by James W. Jackson. Both men were killed in the fracas. 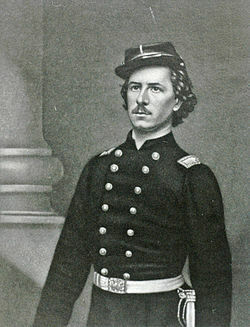 Ellsworth was the first Union officer killed in the war. Jackson was probably the first Confederate civilian slain. On Arlington Ridge, Union Army pioneers immediately began clearing the land of trees. Union generals wanted this ground reinforced and held as the first line of Washington’s defenses. Fort construction began almost as soon as the trees were felled. A low rise perhaps 800 feet above the adjoining terrain, Arlington Ridge ran from just above Alexandria to a position northward directly across the Potomac from Georgetown. The ridge included land later leveled for construction of the Pentagon and Shirley Highway. Geologists believe the ridge may have been the shoreline of the Potomac during flood stage thousands of years ago. Now the ridge became the first line of defense for Washington. Calm in the capital was giving way to rumors, fear and uncertainty. The low-lying city had no natural defense except for the Potomac and Anacostia rivers. The city had no regular troops assigned to protect it. A series of mutually supporting forts began to go up along Arlington Ridge. At the southern end, the fort closest to Alexandria became known as Fort Scott. At the northern end, Fort Marcy stood across the Potomac River from Georgetown. Each fort was really a detached earthwork, which mounted heavy guns, accompanied by a small garrison and as few as 100 rounds of ammunition. During the seven weeks following May 24, the goal was to get as many forts properly situated as practical. Each fort was only about one-half mile from its supporting position. On July 21, 1861, the Union was again shocked when its forces suffered the humiliating defeat at Manassas, or Bull Run, as the Federals called it. Fort construction around Washington was immediately intensified. A second line of forts west of the Arlington Ridge defenses began to go up, and, for the first time, forts were planned and started to the north of the city. In “Mr. Lincoln’s Forts,” authors Benjamin Franklin Cooling III and Walton H. Owen II report, “By 1865, the defenses [of Washington] were impressive, containing 33 named fortifications, 25 batteries, and 7 blockhouses. Field works were established at intervals of 800 or 1,000 yards, with intersecting fields of fire commanding every important approach to the city.” The fortifications included 256 smoothbore cannon, 170 rifled cannon and 60 mortars. The construction of the forts and the accompanying military roads and constant traffic devastated the once fertile fields of Arlington. Although most of the farmers in the rural sections of what is now Arlington County had voted to stay in the Union, they paid a terrible price for their state’s secession. Buildings, livestock and supplies were often seized for military use. By 1865, the area was impoverished. At war’s end, the armies of the Union marched north to participate in the grandest military parade in the nation’s history. On May 18, a two-day spectacle, reviewed by President Andrew Johnson, flowed through the city. Every famous Union army marched or rode down Pennsylvania Avenue. Ulysses S. Grant, William T. Sherman, George Gordon Meade, George Armstrong Custer, all rode at the head of their troops. Philip Sheridan led the cavalry. 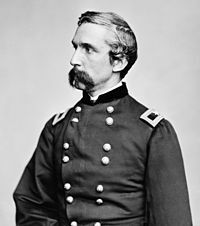 Joshua Chamberlain led his men from Maine. The victorious armies were returning home. Where did this mighty force bivouac while near Washington? On Arlington Ridge. The Army of the Potomac – the designation of which would be discontinued five days after the great review, as would other regionally designated armies through the summer – mingled alongside the cruder “Westerners” of Sherman’s army. The men who had sacked Atlanta and marched to the sea camped by Grant’s more spit-and-polished troops who had chased Robert E. Lee to his end at Appomattox. The men in blue camped on Arlington Ridge. The last official campsite for many Union men of arms was on that ridge. Mustering-out commenced almost as soon as the parade ended. Thus, arguably, one could say the Civil War started and ended on Arlington Ridge, within sight of the still unfinished U.S. Capitol dome and the uncompleted Washington Monument. * John E. Carey is a writer who lives at the foot of Arlington Ridge. This entry was posted on September 21, 2008 at 4:17 pm and is filed under America, American politics, Appomattox, Arlington, Arlington Ridge, Atlanta, Civil War, culture, Ellsworth, Fort Sumpter, history, Joshua Chamberlain, Lincoln, news, politics, Robert E. Lee, Sherman, William Sherman. You can follow any responses to this entry through the RSS 2.0 feed. You can leave a response, or trackback from your own site.